Everyone walks a different path. Some are content and maybe even happy, but there are some who are discontent and searching. In a way, I suppose we’re all searching. One of my favorite quotes from Robert Browning – “Ah, but a man’s reach should exceed his grasp, or what’s a heaven for?” We should always be reaching for new experiences, new horizons. Sometimes we get stuck but we should always be searching and wondering what’s around the bend. This is a theme that runs through Spolighters Theatre’s latest offering, Songs for a New World by Jason Robert Brown, Directed by Andrea Bush and Michael Tan, with Music Direction by Michael Tan. It’s a song cycle that presents us with people who searching and longing for something else and it’s not a show you want to miss this season. 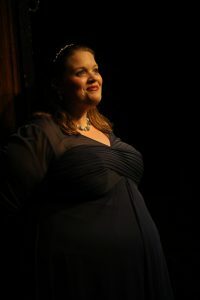 Being a song cycle, which is, simply put, a grouping of songs with a similar theme, there are many ways Songs for a New World can be presented. The original production was more like a cabaret than a full production but it works for this piece. However, Andrea Bush and Michael Tan have threaded this grouping of songs together very nicely, presenting it in the lobby of a hotel where people are coming and going and a million stories are told, started, and sometimes ended. From an attention seeking wife threatening to jump off the ledge, to an up and coming basketball star, to a mother of a fallen soldier, these characters are folks you could easily run into while rushing through a lobby of any hotel anywhere in the world. Alan Zemla’s Set Design is superb and he can work wonders with this intimate space. It’s simple but elegant with bold colors and strategically placed lobby locations that allow for a smooth flow and does not hinder the action on stage. Kudos to Zemla for a job well done… again. I’d be amiss if I didn’t mention Costume Design by Laura Nicholson. With so many different characters played by a small 4-person ensemble, Nicholson has managed to present each character as an individual with varied and appropriate looks from graceful to meager. Every costume for each song is absolutely fitting and well thought-out making for an aesthetically pleasing presentation. Direction by Andrea Bush and Michael Tan is impeccable. They have a tight grasp on the material and the stories these songs tell and have presented them beautifully. Their choice of setting the piece in a hotel lobby works and the pacing is just right. Just as if people were coming and going and pausing for just a moment to tell us their story is refreshing and a sensible presentation. Adding to his Directing duties, Tan wears the hat of Music Director and it’s clear his has a great comprehension of this score. He has guided this cast to tight, stunning harmonies and gathers together a small but powerful pit orchestra consisting of himself on Keyboard, Greg Bell on Bass, and William Georg on Drums. 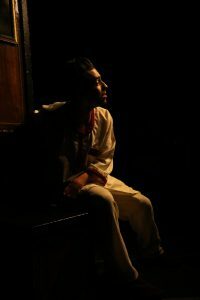 Though not mentioned in the program, keep an eye on the precise and fitting light choreography that takes place throughout the show, courtesy of Michael Tan. It certainly adds value to the production and keeps the audience engaged. Overall, Bush and Tan are to be commended for their work on this through-provoking, poignant, and polished production. Moving on to the performance aspect of this production, the small ensemble is on point with this material and presentation. Using the original casting of just four actors, 2 males and 2 females, it creates a great balance both aesthetically and vocally. All four of these actors and actresses are comfortable and have a strong presence on the stage and give great showings in their roles. and make them relatable making for spot on performances. Andrew Worthington and Luis “Matty” Montes round out this stellar ensemble and add to the balance and blend seamlessly. 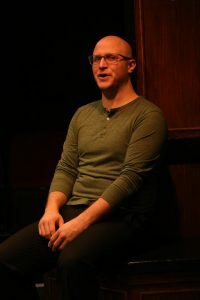 Worthington’s smooth, resonating baritone is a pleasing and is highlighted in his featured numbers such as “She Cries” and the whole-hearted “The World Was Dancing.” His empathy for the characters he plays is apparent and it’s easy to see he’s giving 100% effort, giving a strong, deeply-felt performance. In the same note, Montes fills in the higher registers of harmonies and his tenor cuts through nicely, especially in his featured numbers such as the inspiring “On the Deck of a Spanish Sailing Ship 1492” and the fast-paced “The Steam Train.” Montes is spot on with his acting out of each of these songs and brings you into his character’s stories making for a strong confident performance. 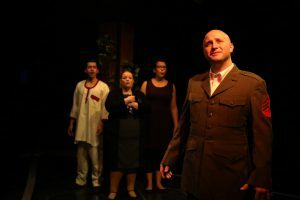 Final thought… Songs for a New World at Spotlighters Theatre is a poignant, thoughtful piece that you do not want to miss this season. Directors Andrea Bush and Michael Tan have created a thread that brings the vignettes together nicely and into a story that easy to follow. The performances are top notch and the small cast has a tight chemistry that is second to none. It’s a small but very well put-together and polished production that has a huge heart. Don’t miss this one. Get your tickets now! 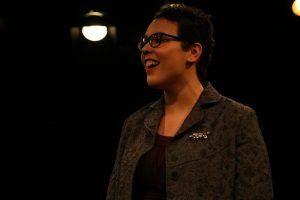 This is what I thought of Spotlighters Theatre’s production of Songs for a New World… What did you think? Please feel free to leave a comment! Songs for a New World will play through November 28 at Spotlighters Theatre, 817 St. Paul Street, Baltimore, MD. For tickets, call the box office at 410-752-1225 or purchase them online. 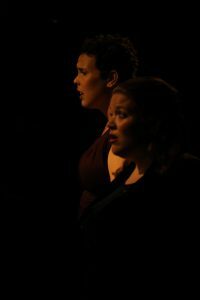 This entry was posted in Reviews and tagged Alan Zemla, Andrea Bush, Andrew Worthington, Baltimore Theatre, Erica Irving, Kristen Zwobot, Laura Nicholson, Luis "Matty" Montes, Michael Tan, Songs for a New World, Spotlighters Theatre by Jason. Bookmark the permalink.